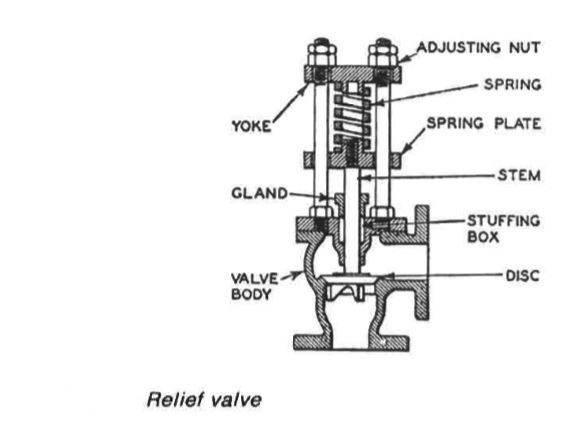 Relief valves: Excess pressure in a ship service system is eased by a relief valve (Figure 1). This consists of a disc held closed by a spring loaded stem. The compression on the spring can be adjusted so that the valve opens at the desired pressure. The special case of boiler safety valves is dealt with in Marine Steam Boilers by J. H. Milton and R, M. Leach. Selection of a valve of the correct size and loading is important since they have a narrow pressure range. Under normal conditions a relief valve should operate consistently within reasonable limits of its set pressure. Incorrect function may be due to the setting, valve seat deposit or damage. Relief valve seats should be checked whenever the pump is overhauled. since they have a narrow pressure range. Under normal conditions a relief valve should operate consistently within reasonable limits of its set pressure. Incorrect function may be due to the setting, valve seat deposit or damage. Relief valve seats should be checked whenever the pump is overhauled. If it is necessary to provide steam or air at a pressure less than that of the boiler or compressed air reservoir, a reducing valve is fitted. This will maintain the downstream pressure within defined limits over a range of flow, despite any changes in supply pressure. In the reducing valve shown (Figure 2) the higher inlet pressure (PJ acts in an upward direction on the main valve and in a downward direction on the controlling flexible diaphragm and the piston beneath it. These two parts are in a state of balance. 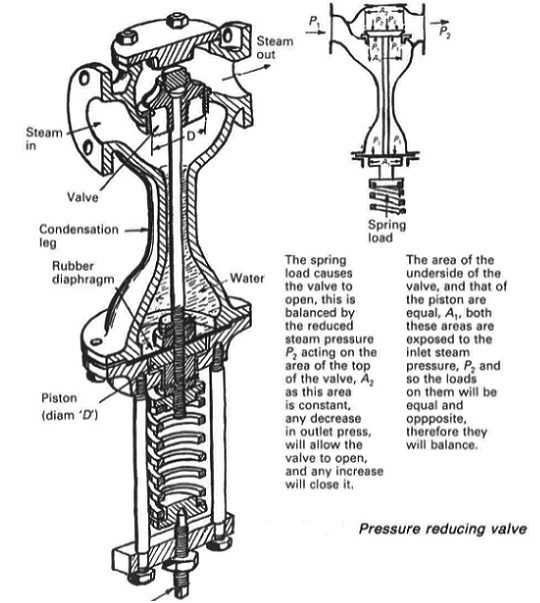 The large spring pushes against the spindle, tending to open the valve against the reduced steam pressure (P2) acting on the area y!2 at the top of the valve. Any decrease in pressure on the outlet side, will allow the valve to be pushed open by the spring. Any increase will close it. It is important that this type of valve is installed in the vertical position. The self-regulating valve can be replaced by an automatic process control valve for fluid pressure control as used for control functions in unmanned machinery spaces. This permits remote control of the set-point of the valve and by careful selection of valve trim (the control industry's term for the internal parts of the valve which come in contact with the controlled fluid and form the* actual control portion) a variety of flow characteristics can be achieved.